Right after my last kayaking trip I threw all my gear in the van, strapped the boat to the roof and tore out of gyro park. 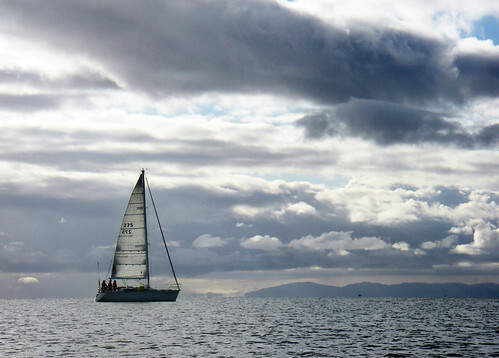 Today was definitely sailing weather and I was totally psyched to get out into oak bay with the conditions. I had to run home to grab my GPS and change. I got back down to Oak Bay moments later and Aaron couldn't find the key for the boat, so we got back in the car and headed out to find the key. Half way out, Aaron found the key in his backpack so we turned around and headed back to the marina again. 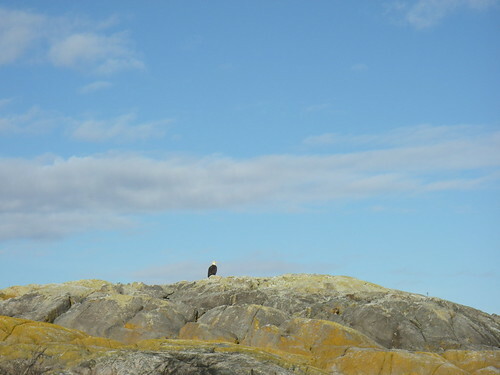 When we got back down to the water, there was a long and low snow cloud on the eastern horizon. The wind had increased to about 15 knots from the northeast. We got the boat all set up and I goofed the exit again - I'm just being too timid and not giving enough throttle for steerage, so the boat kidn of lazily turn swhen it feels like it. The area to pull out in this part of the marina is just tiny, so I'll have to keep working on the undocking. 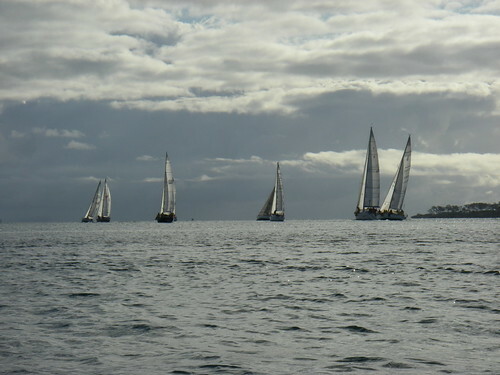 Once we got out past the breakwater, we got the sails up and pleasantly powered up. Today was some of our best sailing yet. The nice wind made navigation fairly explanatory and we were able to keep Red Current on a nice reach all the way out to great chain island. The boat powered up even more once we started our way down Plumper Passage. The tide was just right for getting around the reefy parts of the chain islands and we were saying hello to the bottom of Chatham Island in no time. We're getting a whole lot better at knowing when to tack and where it's going to take us. The middle of Baynes channel had some strange local flood currents going on and the wind had veered down to full easterlies. When the current met the wind we faced some pretty large swell and chop but only for a few minutes. 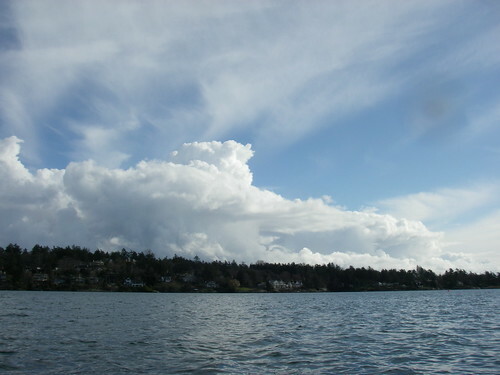 The giant black cloud over San Juan island lazily moved off to the south reveling a snow covered southern headland. With the sudden veer changing our trim, the lost a bit of power heading straight up into the freight train (the standing waves at the mouth of Baynes), so Cadboro point was where we turned around to take advantage of a broad reach home. The current on the way back was close to slack so we were able to navigate right through Baynes and Mayor channel. We got to see a bunch of sea birds out on the chains and the wind calmed down to about 5 knots to deliver us quietly back to the marina slip.